Reading below to learn how to grow and care for an arrowhead houseplant in pots and propagate arrowhead plant in water by cuttings and root division. 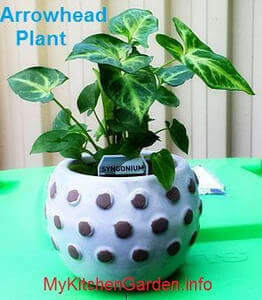 The arrowhead plant (Botanical or Scientific name: Syngonium Podophyllum, Nephthytis Podophyllum) is a fast growing, easy to care plant. Syngonium is known by several names including arrowhead vine, Arrowhead plant, Arrowleaf plant, American evergreen, Goosefoot Plants, Five fingers and Nephthytis. The arrowhead is mostly grown as a houseplant, however, it can be grown outdoors in some places. The arrowhead plant, perfect for a gift, is a great container plant for shades like indoors and balconies that don't get much direct sunlight. When the arrowhead plant is young, it can be planted in a small pot or dish. Older plants will begin to vine and can be grown in a pot where it can be trained on a trellis. It can also be grown in a hanging basket where the vines will hang down. The plant's leaves change shape as the plant matures. The young plant has as an arrowhead shape (heart-shaped) leaf, generally green in color, and then become more arrow-like as the plant grows older. Mature plant can produce leaves 5 -12 inch elongate leaves. When the arrowhead plant is young, its leaves are heart-shaped and become more arrow like as the plant grows older. The care of arrowhead plant is simple. It does not need any special care. There are several varieties of arrowhead plant, each has a unique color of the leaves. White butterfly is the popular variety of arrowhead plant. The arrowhead plant thrives best in bright light, but not direct sunlight. The direct sunlight will cause the plant to burn or bleach. The plant keeps best as a houseplant, however, it can survive outdoors in US Hardiness Zones 10 and 11. It grows best in temperatures between 16 to 24 ºC (60 to 75 ºF). Bring the arrowhead plant indoors if temperatures dips very low. Temperature below 10 ºC (50 ºF) may kill the plant. The arrowhead plant, Syngonium plant can be rooted from cuttings, root division and air layering. Take the 4-5 inch cutting in early summer and put one end in water. The arrowhead plant cuttings are easily rooted in water. It is also very easy to grow from root division. Its roots are quite dense, just divide the root keeping a small palnt to it and repot. The arrowhead plant requires humid conditions for optimal growth. You can mist the plan. Allow the soil to dry out slightly between watering. Do not over-water, just keep it moist. Over-watering will cause root rot. Over or underwatering the plant will cause leaves to turn yellow and plump. You can place the pot on a tray filled with pebbles and water to increase humidity. Limit on water in fall and winter. If you are keeping your arrowhead plant indoors, avoid dry air from heaters and mist the leaves to improving humidity. If the tips of the arrowhead plant are turning brown or yellow, it means the air is too dry. Mist the leaves often. Feed your arrowhead plant with a balanced liquid fertilizer every month. Lack of nutrienets in soil, light and over-watering will retard the growth of the plant. However, the growth will slow down during winter months. You may see spider mites, aphids, scale and mealybug insect pests on your arrowhead plants. If you do not prune a growing arrowhead stem, then it will grow into a vine and the foliage will turn out of arrow shape. How to prune an arrowhead plant? Simple, just cut off the growing climbing stems to give the plant a bushier appearance with the arrowhead-shaped leaves. If the arrowhead-shaped foliage is preferred, simply cut off the climbing stems as they develop. The arrowhead plant produce flowers somewhat similar to those of the peace lily. The roots of the plant becomes very extensive, so in spring re-pot the plant every second year. Is arrowhead plant poisonous? All parts of the Arrowhead vine are mild to moderate toxic if ingested by humans and pets. Always wear gloves while working with the arrowhead plant, as its sap may be irritating to sensitive people. Ingesting this plant can cause stomach upset, vomiting and skin irritation. Keep your cats and dogs away from arrowhead plant.